Atlantic Palms are beautiful upmarket beachfront self-catering apartments located in Sunset Beach. Situated next to the beach, you are treated to unsurpassed sunset, ocean and mountain views from the apartments. The Atlantic Palms apartments are only 15 minutes from Cape Town City Centre. Many other attractions and activities such as golf, Winelands tours, hiking, city nightlife and sightseeing opportunities are in close proximity. The best kite surfing and windsurfing beach in the world are right on your doorstep. Atlantic Palms consists of five self-catering units. All units have a lounge, dining room, kitchen, en-suite bathrooms and private patios; all luxuriously fitted for the guests’ comfort needs. • Two bedroom units which sleep four guests each. 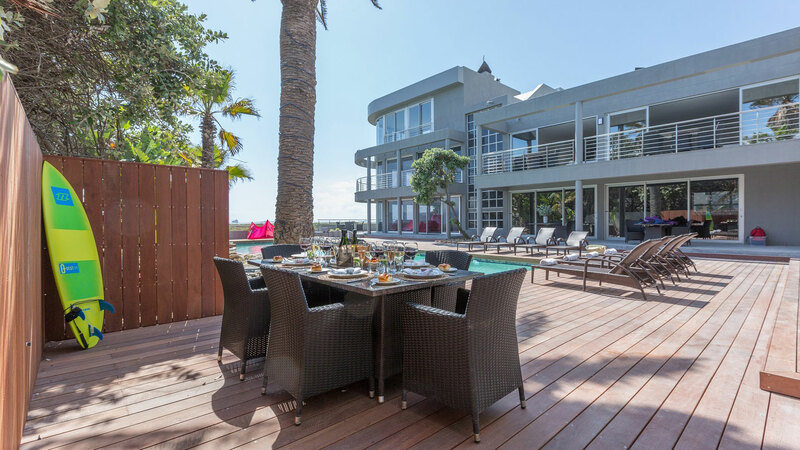 From the private balconies of each elegant suite, one can enjoy unrivalled views of the South Atlantic against a backdrop of Cape Towns most famous landmarks; Table Mountain and Robben Island. Only meters from one of the most pristine and secluded beaches in the area, Atlantic Palms provides a tranquil and intimate setting.